This is a big book about a big man, Pierre Berton. Known to every Canadian who read a newspaper or watched TV over the last 50 years, Berton was one of the leaders who brought Canada out of the shadow of the U. K. and U.S. and helped shape our own history and identity. He did it as a writer on Macleans and The Toronto Star, and on TV on the long-running Front Page Challenge. He published a string of best-selling books such as The Klondike, The Last Spike, The Comfortable Pew. Berton was born in Whitehorse, eventually went south to the University of British Columbia where he wrote for the college paper, and then settled in to the publishing world of Toronto. He was a devoted, if flamboyant, family man, with six children. They lived in Kleinburg, outside Toronto but Berton spent most of his time flying and speaking all over Canada, defending what he thought best for the country. A. Brian McKillop is Chair of the Department of History at Carleton University. 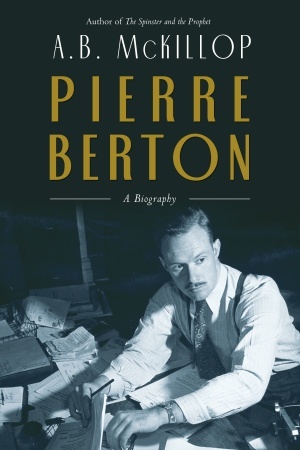 Like his earlier prize-winning The Spinster and the Prophet, this book gives a thorough and dazzling picture of the times Berton lived in, as well as a sensitive portrait of Berton himself. It is a fine combination of history and biography.